the Serbian can breathe in the relief that cements him as perhaps the greatest player in tennis history. This was the title he had to win, and he did it. He is at the moment the undisputed No. 1 player. 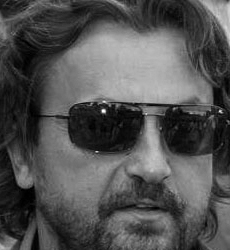 Henri Leconte was not only one of the best tennis players in the world, furthermore, he was a character. Someone who was having fun on the court and sharing it with the audience. Tennis fans can witness him in action in summer at the “Hamburger Rothenbaum” and be sure that he is still the same fun person as he was in the past. 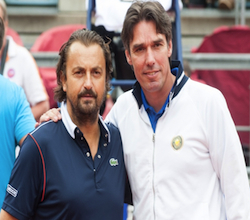 At the Lombardium Classics on July 10th at 6pm Leconte will play against Michael Stich. The legends match is the very first highlight of the German Open from July 9th to July 17th. I'm doing my daily TV show 'Avantage Leconte' on Eurosport. I promote my other passion which is: Padel! See you there, à bientôt! 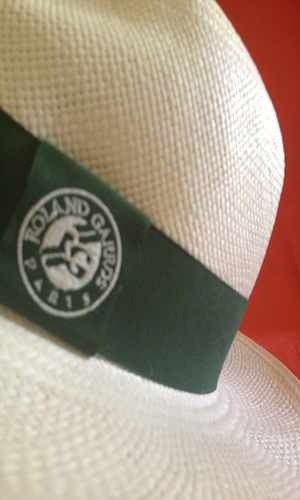 Is it possible that Gael Montfils wins Roland Garros? 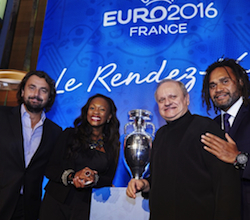 Famous names from the world of sport, including Gérard Houllier, Christian Karembeu, Henri Leconte and Laura Flessel, descended on the flagship Hédiard boutique at Place de la Madeleine in Paris on Tuesday for the introduction of the three prestigious suppliers for the hospitality programme at UEFA EURO 2016: Do&Co, Hédiard and Joël Robuchon. Do&Co – who provided hospitality services at the last three UEFA European Championships – took over Hédiard in June 2014. The French fine grocery purveyor has been chosen by UEFA to deliver the catering services for the UEFA EURO 2016 hospitality programme. "The hospitality programme is aimed at business clients and involves ticketing, catering, parking, a personalised welcome service and gift packages," explained Jacques Lambert, president of EURO 2016 SAS. 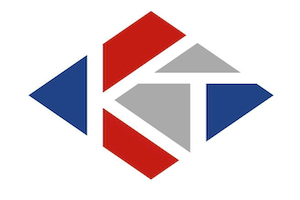 "It is a commercial and public relations product that has become of the utmost importance for client-facing companies, who are now fond of major sporting events as ways to develop their business. In 2016, the EURO will be the biggest commercial forum on the continent." The hospitality programme for UEFA EURO 2016 will be divided between holders of two passes, gold and platinum, which will guarantee business spectators access to matches in the best conditions. "There is only one option for any company wanting to ensure they can invite ten or 15 clients to matches and reserve a box throughout the EURO: get involved in the hospitality programme," continued Lambert. In 2012, 1,200 companies from 60 countries were hosted in boxes and hospitality areas at stadiums in Poland and Ukraine, figures that should increase appreciably in 2016. That is music to the ears of Haig Asenbauer, chairman of the board of directors of Hédiard: "We are very honoured and proud to have been chosen by UEFA to provide hospitality at EURO 2016," he said. "It's a sizeable challenge because this EURO, with 51 matches and 24 teams, will be the biggest European sporting event ever. We are aiming for excellence. This EURO will take place in France, a magical country teeming with history and with a world-class gastronomic reputation." Do&Co and Hédiard have selected the decorated French chef Joël Robuchon to take overall charge of culinary matters and supervise the 200,000 meals that will be served to hospitality guests during the tournament. "I am going to create recipes that take into account the specific characteristics of each region of France," said 'the man with 25 stars'. "In the coming months, I will draw up the menus for each of the ten host cities, and brief the teams who will produce the dishes." There can be no doubt that chef Robuchon's outstanding reputation will offer yet another springboard to showcase the art of living 'à la française' to the whole world. "Our partnership with Joël Robuchon shows our desire to make this EURO an unforgettable time for businesses who opt for our hospitality programme," explained Asenbauer. See some of the world’s greatest tennis legends play during Kings of Tennis at Stockholm Waterfront Congress Center. Only former champions will participate. In order to qualify for the tournament, the players must either have been ranked no.1 in the world, be a Grand Slam winner/finalist or a singles player in a winning David Cup team. Players 2016: John McEnroe, Mats Wilander, Pat Cash, Henri Leconte, Thomas Muster and Thomas Enqvist. In 2014 Henri Leconte sensationally outmaneuvered seven-time Grand Slam winner Mats Wilander 4-6, 6-1, 10-8 in a thrilling match at the Stockholm Waterfront Centre. 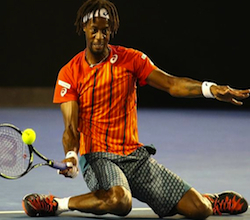 Despite a valiant effort from Wilander, his French opponent could seemingly do no wrong. His racquet transformed into a magic wand, able to create winners at will from anywhere on the court. Checkout the 2016 legend matches in Stockholm. More info just click here. 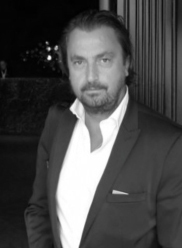 Henri Leconte was in February 2016 in Mauritius for the launch of the tennis padel. The former tennis champion Henri Leconte was in Mauritius last week to promote tennis padel and to launch this sport in sports clubs and hotels in Mauritius. Tennis Padel is a mixture of squash and tennis. This sport is played by some eight million people across the world. It is is very big in Hispanic countries. It is played outdoors or indoors, with small light rackets, a field closed and surrounded by high glass walls. First tennis padel courts will open October 2016 in Mauritius. Top-ranked Novak Djokovic maintained his perfect streak in six Australian Open finals with a 6-1, 7-5, 7-6 (3) victory over Andy Murray, equaling Roy Emerson's record for Australian titles. It is his 11th Grand Slam Tittle. Björn Borg and Rod Laver have as well 11 Grand Slam Titles. Roger Federer is still leading with 17 Grand Slam Titles. Unbelievable! Germany’s Angelique Kerber stunned world number one Serena Williams in three sets to win her first Grand Slam title at the Australian Open. Kerber, seeded seventh, won a thrilling final 6-4 3-6 6-4 at Melbourne Park. Djokovic sets semifinal clash with Federer at Australian Open 2016! Novak Djokovic defeated Kei Nishikori to set a mesmerizing semifinal clash for Thursday with the one and only Roger Federer. Can Federer reverse his trend of Grand Slam losses to Djokovic?